~Dolby-Atmos-branded speakers + two downward-firing speakers are two subwoofers. I for one is not that happy about a smaller battery (51 Wh for X1C7, vs 57 Wh for X1C6) to make room for the two subwoofers in X1C7. I personally "mute" my computer 95% of the time, as it is a work computer, so subwoofers are not needed. But I do NEED a battery that is as large as possible, since one cannot swap the X1C7 internal battery. What are your thoughts on decreased battery size? [Edit: OK, to put this into perspective, my current X1C4 comes with 52 Wh battery, basically same as the proposed X1C7. The X1C7 with the carbon fiber weave will look great with my Pagani Huayra. Jokes aside this is an interesting step that Lenovo is taking with the X1C, they are adding subwoofers to them, making it more HiFi. Really whats the point of having a HDR compliant display if your audio sounds like meh without headphones? Perhaps this will be the start of the X1C's evolution, becoming more of a multimedia ultrabook device than just purely business lightweight. 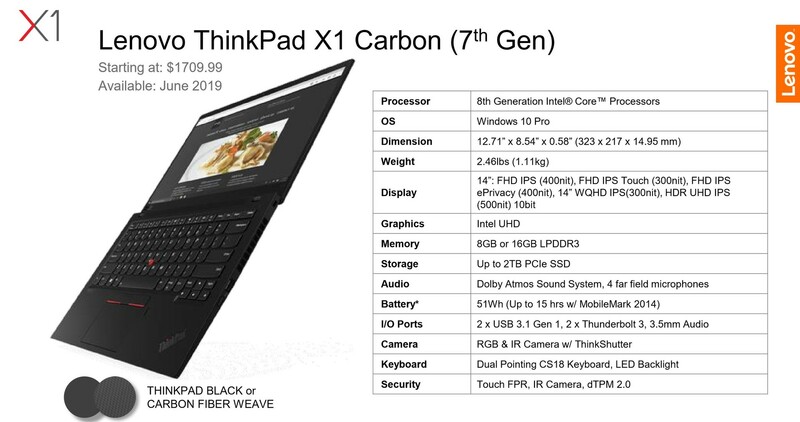 The carbon fiber weave will definitely be an attractive option for some, I for example had wrapped a few ugly ThinkPad lids with a carbon fiber vinyl. Wish it would have 3:2 display, but we know most consumers hate seeing black bars on their screen when watching video, hopefully the X1 Tablet will have the CF weave. Makes me wonder if they'll add subwoofers to T490s? Maybe T481s? What's the difference between the new and old speakers? Oh I know! A Dolby sticker and a 50$ price jump! Where can I find a comprehensive comparison of Gen7 vs Gen6 in a table form and not in a long review text? I'm due a company laptop refresh in June and am deciding whether to wait for a Gen7 one or rather go for a Gen6 one. Smaller battery is an obvious disadvantage of Gen7 vs Gen6 for me, so unless Gen7 is so much better at other things that matter perhaps I'll rather go for a Gen6 one. But I struggle to find a similar summert chart for X1C6...can anyone help?